Ethical leadership correlates with better employee performance . Such leaders model ethical behaviour and standards that attract high-value employees who know that they will be heard and taken care of, resulting in team members who are more satisfied with their job, more committed, and less likely to say they plan to leave the organization. There’s also growing evidence that running a more ethical company pays off financially , including indices that demonstrate that over time ethical companies beat the MSCI and S&P 500 index (see a talk by Jonathan Haidt at the 2016 Aspen Ideas Festival as well as Ethisphere’s World’s Most Ethical Companies list, and the Good Company Index ). Leadership is an essential ingredient in designing ethical systems, and anyone can learn how to become an ethical leader. As Ethical Systems Collaborator David Mayer outlined in Fast Company, leaders need to be not only good people but also moral managers . 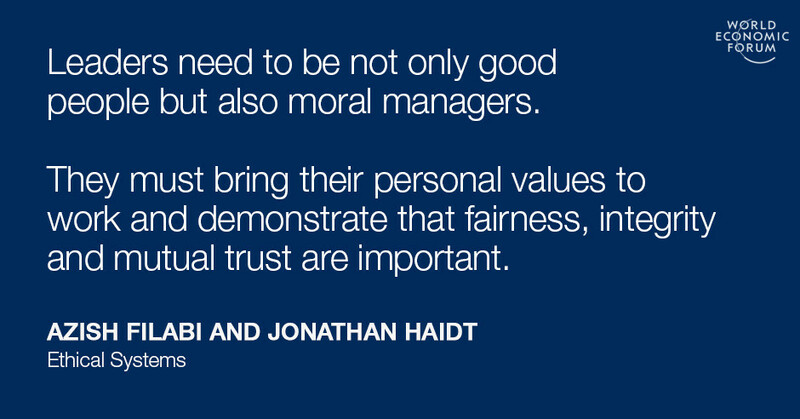 They need to bring their personal values to work and also demonstrate that fairness, integrity and mutual trust are of prime importance in their management style. To facilitate ethical leadership, executives should also strive to make their company a learning organization . Such organizations view failure as an opportunity for education, and they develop cultures that support employees who speak up about ethical and operational challenges. Too often we see executives dismiss ethical failures as the fault of a few bad apples, rather than treating them as opportunities to look for a bad barrel – that is, a close examination of the systemic causes and consequences that contributed to those behaviours.